Dwarf Bulbears (チビクマ?, lit. : "Dwarf Bear") are enemies found in all three Pikmin games. 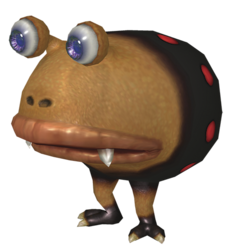 Unlike Dwarf Bulborbs, members of the Breadbug family that mimic larger Bulborbs, the Dwarf Bulbear is the true juvenile version of a larger grub-dog, in this case the Spotty Bulbear. Dwarf Bulbears are notably tougher and more alert than Dwarf Bulborbs, and in the second and third Pikmin games they are known to follow Spotty Bulbears. In Pikmin, Dwarf Bulbears are essentially stronger versions of Dwarf Red Bulborbs. They are found sniffing the air instead of the ground, and can notice Pikmin from a greater distance. They have almost 40% more health and are able to stand more than one direct hit from a Pikmin. Dwarf Bulbears shriek when aggravated to alert any Spotty Bulbears in the vicinity. To shake off Pikmin, they swing their bodies first, and then perform a backflip. This shaking behavior is exclusive to this creature and this game. In Pikmin 2 and Pikmin 3, Dwarf Bulbears act even more similar to Dwarf Red Bulborbs, sniffing the ground and shaking off Pikmin with a regular head-shake. And although they have substantially more health in these two games, a single Pikmin thrown onto their back kills them instantly, unlike in Pikmin. They are now slightly more alert, however, and they do not delay in noticing a Pikmin in their territory. They will sniff the ground faster and perk up almost instantly when a Pikmin or leader is near. A Dwarf Bulbear's behavior will change when a Spotty Bulbear is present. Spotty Bulbears now roam a patrol route in search of food rather than sleeping, and if they come across a pack of Dwarf Bulbears, the dwarves will "yip" and follow the parent. The dwarves' main objective is food, however, and they will stray from a Spotty Bulbear to chase Pikmin or leaders. Like the Spotty Bulbear, Dwarf Bulbears have a mammalian appearance and a black backside with red spots. The Dwarf Bulbear also has the mouth texture and snout structure of the Bulbear, and they share eye colors across the games. In Pikmin, all Bulbears have red eyes, and in its sequels, they have deep purple eyes. The Dwarf Bulbear is rather durable, which reflects the defensive strength of the Spotty Bulbear. When not following a parent Bulbear, they tend to be found in groups of two or three. Dwarf Bulbears' habit of following a parent is similar to that of actual bears, although bears and most mammals do not define a route so much as a range of territory. Dwarf Bulbears are able to "switch parents" if their current "parent" is defeated or the Dwarf Bulbear becomes lost. It will follow the nearest Spotty Bulbear whenever this happens. This is most commonly seen in the Subterranean Lair in challenge mode. To do: This needs elaboration and proof to be added to the glitches article. There's a glitch in the Piklopedia for Dwarf Bulbears while eating Pikpik carrots, in which they die instantly. You can easily defeat this creature by swarming it with a large group of Pikmin. If only a few are available, throw Pikmin onto the Dwarf Bulbear's back and then call them back to avoid Pikmin deaths. This creature can cause the crushing glitch when defeated, in Pikmin. Defeating a family of Bulbears is much more dangerous and challenging, as the Dwarf Bulbears both defend their parent from behind and attack Pikmin that are shaken off in battle. It is generally best to defeat the Spotty Bulbear first, though, since it is a worse threat and can travel farther than the juveniles. In Pikmin 2, a well-timed ultra-bitter spray can petrify the entire group of Bulbears, including the parent. With a bit of luck, a barrage of Purple Pikmin can also stun all the creatures within a small radius, leaving them vulnerable to attack. In Pikmin 3, bomb rocks are the least costly method of taking out the family; normally enough bomb rocks are provided near the Bulbears' territory. If bomb rocks are not available, attack the Spotty Bulbear from the front, aiming for the eyes, and keep Pikmin from straying too far to avoid the dwarves. After the parent is defeated, go for its offspring: throwing direct Pikmin hits on their backs is most effective, but with a large army swarming can most likely work faster with few losses. Attacking Dwarf Bulbears from behind is the most effective strategy. It might take a while to defeat, but it is by no means a difficult task. See more: Grub-dog family#Naming and Spotty Bulbear#Naming. The Dwarf Bulbear is a smaller version of the Spotty Bulbear, so hence, it shares the word "Bulbear". In Japan, it is called チビクマ?, which means "Dwarf Bear", just like how the Spotty Bulbear is called クマチャッピー?, or "Bear Chappy". The scientific name, Oculus terribilis, is the same as the Spotty Bulbear's, but the mature grub-dog also has dotticum in its name. Internally, it is called chappb in Pikmin, which is the same name as the Dwarf Red Bulborb, chappy, but with a B at the end, potentially short for "bear", or simply meaning "the B version". In Pikmin 2 and Pikmin 3, the internal name is kumakochappy, which actually uses a different size qualifier from its regular name: it uses コ? (lit. : "young") instead of チビ? (lit. : "dwarf"). コ? is used in the normal Japanese name of all other "dwarf" enemies in the series. A Dwarf Bulbear in the enemy reel. Seven Dwarf Bulbears on the Piklopedia. Dwarf Bulbears as seen in the Pikmin 3 footage shown on the Nintendo Direct of the May 12th, 2012. A group of Dwarf Bulbears in Pikmin 3. A Dwarf Bulbear eating a Winged Pikmin. Close-up screenshot of a Dwarf Bulbear in Pikmin 3. An animation demonstrating the Dwarf Bulbears' pulsating dots, even with the pause menu opened. Concept artwork of a group of Dwarf Bulbears. The creature's e-card, #08 (17th red card). This page was last edited on March 5, 2019, at 04:07.